During 2016, I start to venture into a new business using email marketing strategies, I had launch 4 successful cold email marketing campaign and make a lucrative income as my side business. That time, I am using a self-hosted email marketing software with 3rd party SMTP service without getting any tracking and report, this also a reason for me looking for a good solution where I can see how many open, click and etc. When I get to know xMails, I don’t have much confidence like MailingBoss does, not much fair review or neutral xMails review out there mostly is the marketer who provides review is just another review where promoting this product, all claims it is SUPERB! After researching for almost a week, I found that this product is back by few famous marketer Jai Sharma, Dr. Amit Pareek, & Ankit Mehta. They also had experience in creating good marketing tools for the pass in the Internet Marketing arena. Furthermore, xMails is pretty new, launching at 25th November 2018, and having their launching promotion and I am thinking why not have a try since it had a 180 days money back guarantee. I manage to grab their offer 1 day before the promotion end. I bought it at $97 lifetime access before it went into $197/Month. It is a pretty GOOD DEALS, right? Nightmare happen! I wish to be a happy customer, unfortunately, I facing a few issues by setting up xMails as well as sending my ever 1st newsletter. First, I try to configure SFP, DKIM, DMARC for one of my domain. I having issue by configuring DMARC as I already had my previous SMTP service provider’s DMARC configured in my domain; immediately I open a support ticket with Bizomart (xMails’s helpdesk). The support agent reply gives me a feeling they are just a robotic respond, no personal touch, not putting effort to read customer question/issues and simply reply me to watch the video tutorial. Right before I got their last respond, I actually went to my previous service provider, and they told me _DMARC are not allow to configure 2 within the same domain name. They share me a link as well: https://mxtoolbox.com/problem/dmarc/dmarc-multiple-records to proof their statement is correct. Yet, xMails had no idea with my question from the beginning until the end! After setting up the SFP, DKIM, and DMARC, I had setup a list of 14 emails, contain my personal Gmail, Hotmail, Zoho mail, Yahoo mail, MS Exchange, as well as self-hosted webmail. I launch my 1st newsletter just for testing purpose. After sending, 14 email mark sent, unfortunately, I found more than half of my email MIA (MISSING IN ACTION). 3 day later, I send a 2nd test email, similar issue happen. I never receive any single email from my Zoho, Hotmail, Webmail and MS Exchange, not in SPAM folder as well. For Gmail, I receive the 1st test, but not the 2nd. 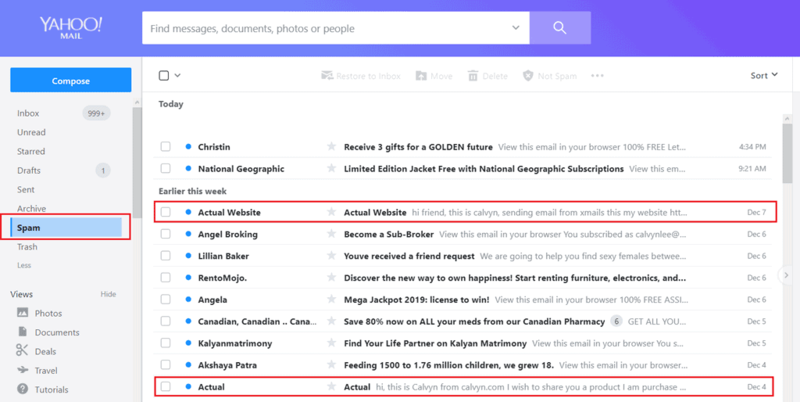 For Yahoo, I receive both, yet fall into the SPAM folder. [10-Dec-2018] According to support, xMails is new, a lot of unethical users use their system to SPAM around, this cause their IPs been blacklist and they are in the middle of fixing it. Is kinda fair enough for this reason, well, support promise me within the week will be solve, the support personal give me his name and give me his word as well, but after a week, no improvement, and the support agent went holiday when I try to follow up again. During I purchase, there is 2 plan, xMails personal plan at $47 and xMails commercial plan at $97. I purchase the commercial plan as some of the features such as automatic pixel placement, deep analytics, able to integrate with Zapier, 30 minutes respond time (Which I don’t see it yet) and few more feature that I would like to use it. Unfortunately, a lot of the feature in the dashboard are blocked. Example the report page, my test campaign for 14 emails, I am unable to see the report for Link Activity, Lead Activity, Technology, Location. It shows Error: Please Upgrade your Subscription Plan to Use This Feature! Apart from this, I am also unable to add new user in my Team Management‘s section. When I using MailChimp FREE plan, there is a footer promoting MailChimp for every email we send to a subscriber. This is fair as we are using it for FREE, in an exchange with FREE publicity for MailChimp. Yet, xMails, there is no way to disable the footer at this moment. Basically, we are doing charity to promote xMails? Right after I turn off mine, I make a test email to my Gmail (Since Gmail is the only platform I can receive my test email and it goes into INBOX directly), the powered by xMails logo had disappeared. This is a good sign from xMails, at least I see the team is starting accepting customer feedback and improving the system, yet a lot of member share in facebook group, it still showing xMails logo even turn up the setting. xMails had a facebook group for discussion and sharing. I personally put feedback and it pending for admin approval, days later, my feedback is not published and deleted. From the group, I don’t see a single person post where it biases slightly negative or reporting an issue, mostly is giving a positive comment or either the admin make an announcement. Guess what, ton of negative comment, complaint, scolding at the comment of each post. This is really not healthy as the admin delete/remove all feedback where it bias to negative or user reporting an issue. In my opinion, it is not transparent and gives me a feeling that they try to hide thing to the public. 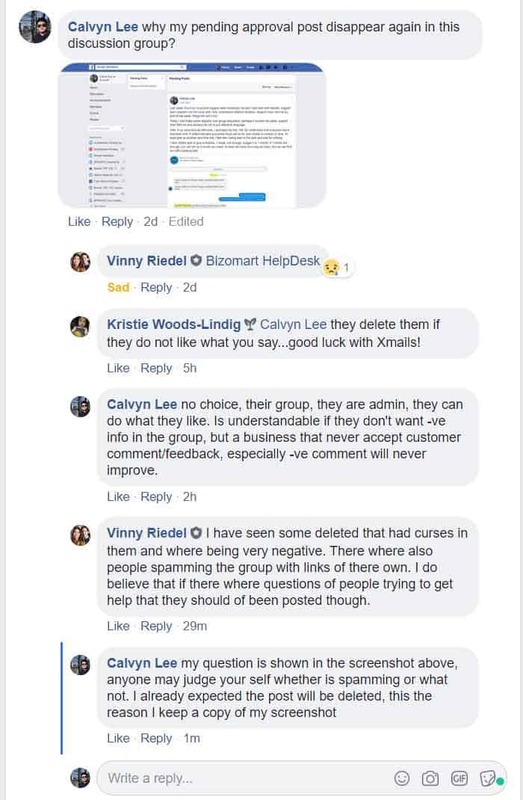 [21-Dec-2018] Again I posted another question over the group, and I already expected xMails’s admin will never approve and deleted the post, hence screenshot it, and 2 days later my post was deleted and I had published it over a comment in of the general post, yet xMails choose to ignore me. Apart from all the issue mention above, I see xMails had a huge MISTAKE in term of their business strategies. In local Malay language, we call it “KANTOI” action (search google if you want to know this meaning), in Chinese, we call it as “handgun” action. Mean a person done a silly action that not suppose to happen on this person. Well, as some of you might see people comment over forum and discussion group xMails not even using their own Paypal account to collect payment from the customer. Well, this is truth and the reason is kinda valid as this 3 developer is from India, their government had strict rules and regulation toward JVZOO and Paypal, hence they require someone out from India’s PayPal account to collect payment, hence they borrow an American guy’s Paypal account, yet, they don’t join venture with this American guy. Just Imagine you buy a product from Company A, and you found that Company B is collecting the payment from you. Company B discloses that they, not the product owner, they just help to collect payment. “KANTOI”, how customer think? Above is my personal review for xMails as a new user, I try to stay neutral, although my review sounds negative with all the issue I face, I am not a HAPPY CUSTOMER at this moment, yet I still had faith with them and hope they don’t take the fate away from a customer. Well, if you did not purchase xMails yet, just take above as a reference, and I personally think that they still had much more room to grows and improvement. I will definitely share more on my xMails experience soon. [10-Dec-2018] Some of the issues I mentioned above had been solved. This gives me a feeling that xMails are doing their job, taking customer feedback. I am still having faith with them, and hope to see more improvement. [23-Dec-2018] xMails don’t appreciate my faith and choose to take it away. Final test, there is still similar problem, support ticket is no respond and I had to choose to move on. Earth can’t stop spinning because of them. I had no choice just ask for a refund. Below is their sky high promise sales video.